Our community has 3,116 members, 205 online now. We’ve published 9,781 stories, shared 8,327 images, made 10,348 blog posts and written 121,546 forum posts. Home · Fantasy Stories · The Warrior Princess Chapter 4. I placed my left foot into the stirrup then, taking hold of Fleet-Foot's snow white mane and with my other hand on the saddle, bent my knee and pushed up, swinging my leg easily over his back, the loose material of my dress spreading out over the saddle. I took a moment to settle myself and adjust my cloak over my horse's back, then looked across at Astrid. She was already mounted and looked fearsome in her brown leather garments, her Draaken head sword at her side and her jet black hair pulled back into a plait leaving her beautiful face free. She looked back at me and smiled, her dark eyes flashing, the adrenalin flowing through her. She nodded and I smiled, nodding back. She raised her arm and, almost simultaneously, we dug our heels gently against the flanks of our mighty steeds and moved slowly and quietly into the shadows of the giant trees. We travelled as quietly as a thousand men on horseback possibly could, following the road we had planned because of its firm but soundless, surface. For the next hour, we rode without a word, not wishing to alert the enemy yet listening intently for any sign that we might be ambushed. Ahead and around, lone outriders checked for the enemy and regularly reported back until we finally reached the edge of the forest and the trees began to thin. Astrid raised her hand and the assembled army came quietly to a halt, just inside the tree line. 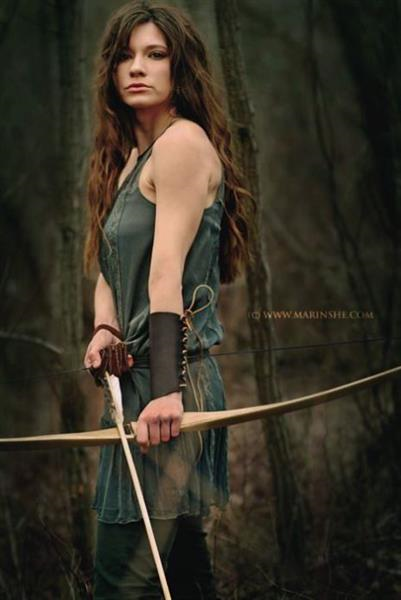 We waited until all the scouts had returned, reporting that, as far as they could tell, the enemy were totally unaware of our movement then, finally, after what seemed an eternity, the Warrior Princess raised her arm and let it fall, signalling the gathered troops behind her to move off. Once again, we spurred the horses on to trot gently along the road. Speed was important now we had no cover but it was also important not to tire the horses as we still had some days journey ahead of us, riding during the long dark hours and resting during daylight. I could not see Astrid now but, somehow, sensed her presence near me. I began to think about what would become of us after this was over. I wanted her, that was true, but how could we possibly be together. Two Queens, no King, It had never been heard of. Would the people accept such a thing? No, I thought, they would not. There was no choice, we could be friends but we could never be together. We rode like this for mile after mile, league after league, no-one speaking, all, no doubt deep in thought about what the end of the journey would bring... if, of course, we got to the end. Above the gentle sound of the horses walking quietly behind us, I heard many sounds in the darkness, owls screeching and hooting, the occasional sight of creatures scurrying out of our way but, by far the worst were the howls of wolves. These animals had never been tamed or harnessed by any, They were a creature that was a friend to none but themselves. They hunted in packs and were fearless killers so, although they would not give away our progress to Samerron, they were still not to be underestimated. The long dark hours passed and then a thin, dark blue line began to form along the horizon. We turned off the road and began to make camp out of sight of passing eyes. We could not pitch tents so we slept with our horses for warmth. Astrid and I walked together through the camp, ensuring all was well and everyone settled before we too sat beside each other between our own horses. "There is something wrong, isn't there?" I asked her. "Yes, there is," she replied. "Fabian was supposed to meet us here." "Maybe he was delayed. He is flying in the dark after all." I tried to reassure her. "Yes, maybe but even so, I am still worried." I took her hand and squeezed it. "He will be fine. Now, we must rest before the next march at nightfall." She looked at me and smiled, her careworn face brightening for a moment. "I am glad you are with me," she said. I smiled and nodded agreement. We didn't speak anymore as we ate a meagre meal to keep our strength up, before lying against our horses and letting sleep take us. I slept fitfully, unable to relax, listening for any sound that might indicate peril then dozing again until the next sound. I woke again as the sun was beginning to dip into the west. Astrid was sitting upright, alert and looking around. "I don't know," came the reply. "It is too quiet. No birds." I remembered the screech of the Eagles when I was on my journey to find the forest. She was right, I hadn't heard one all day. "I am not sure but I do not think we are alone. I don't think our movements have passed unnoticed. I was foolish to think we would not be seen, so many horses." "We had no choice," I reminded her. "It just means we have to be extra alert." I paused for a moment as I considered the situation. "Tonight," I ventured, "We have to pass through the Gorge of Karaden. It is steep sided and narrow. If Samerron is watching us that is where he will attack I am sure." Astrid looked at me and nodded thoughtfully. "Hmmm... Yes," she said. "We need to be prepared." "There is a little-used path that leads up and over the top of the cliffs." I continued. "It is not wide enough for all the men but if I lead about a hundred up that way, we can provide some protection at least." "Yes, I agree." she said, "Choose your men and take them right away. You need to be ahead of the main body." She paused. "Damn, I wish I knew what had happened to Fabian!" This time I did not reassure her as I too was beginning to fear for him. I chose a hundred riders for the strongest horses as the path ahead was steep and rocky and as the sun dipped below the horizon I went to mount Fleet-Foot. Astrid rode up beside and leaned close as I climbed into the saddle. "Take great care, Anna," she spoke quietly so as not to be overheard. "I shall not rest until you are beside me again." "That will be soon," I replied, "I promise." I dug my heels into my horse's flanks and rode off back towards the road. I dared not look back as my heart was heavy and I knew not whether I would see her again. The remaining light had faded by the time we reached the rocky terrain that indicated the start of the gorge. I had briefed the riders when I picked them so there was no need for further discussion as I turned Fleet-Foot away from the road and onto the rough, uneven path that was to wind tortuously up the cliff side. We went slowly, picking our way in the darkness, unable to see more than an outline of the edge of the path. Keeping tight against the steep rock face to our right, we kept away from the near vertical drop which fell away to the left. After about two hours of nerve-racking travel, Fleet-Foot suddenly stopped and, no matter what, would not take another step. The other horses all stopped behind me as there was no room to pass. "What is it?" I whispered into his ear, patting the side of his neck as I leaned forward in the saddle, "What is wrong?" but still he would not move. Swinging my leg over his back, I carefully dismounted and drew my sword, using its tip to feel my way along the ground ahead of me. I had not taken more than a few steps when I lurched forward, the sword stabbing into thin air and, had I not been holding his reins, I would have fallen into the gorge below. Fleet-Foot snorted and lifted his head, pulling me back from the edge of the abyss before me, a few loose stones clattering their way into the cold night air and echoing around the steep walls of the gorge. I had not cried out but if there were enemy spies about, they must surely have heard the falling stones. I listened carefully but I heard nothing I didn't expect to hear but now we were in trouble. We could not go back, there was not enough room to turn the horses, and it seemed there was no way forward! I couldn't risk lighting a lantern, it would be seen for miles, no, the only option was to feel for a way in the darkness and try to get a picture in my mind of what was left. By this time I had been joined by one of the riders. His name was Halberad, a section leader whom I had selected to lead my group and because of his powerful horse. "The path has gone, Halberad," I told him. "Then we are in trouble," he replied, "Do we wait until daybreak?" "No!" I hissed, "We cannot wait! We cannot leave them undefended!" I thought carefully, there was no question of remaining where we were and it was far too dangerous to try to turn the horses on such a narrow ledge in total darkness. There was just one possibility, a hope beyond hope, that the ledge had not completely gone but only part of it. It was time to play the blind-man. “I need a rope and blindfold,” I said to him. “My Lady?” he questioned. I couldn't see his face in the darkness but I could tell he was nervous. “A rope and blindfold,” I repeated and before he had time to protest, I explained my plan. Halberad disappeared and returned moments later with a coil of light but strong rope and a wide sash of heavy fabric. I took the sash and tied it around Fleet-Foot's head, covering his eyes. I was sure he would follow me anyway but if he couldn't see the danger ahead he would be happier to trust me. I took the rope next and tied the end around my waist, ensuring it was secure, then passed the remainder back to Halberad. He put his hand upon mine. I squeezed his arm and released him then drew my sword from its scabbard. Keeping close to the cliff face I began to inch forward, using the tip to feel the ground in the blackness ahead of me and soon, the path disappeared again. This time I was ready and, finding the edge of the abyss, tapped sideways toward the cliff face. Very quickly I found the edge of the broken path. I couldn't believe my luck. The path had only fallen away a few feet and, amazingly, the cliff face curved inwards. I soon had a picture in my mind of what remained. For a distance of about three feet, the path was just around two feet wide but opened again to about five feet because of the cut in the wall. I began to move forwards, carefully gauging the ground ahead, Fleet-Foot following faithfully behind me. Before too long, the wall began to move back out but the path had become wide, much as it was before the collapse. I concluded that some of the rock-face had broken away, the huge rocks smashing the path away but leaving a space in the cliff from where it had collapsed. I tugged the rope and felt it loosen after it twitched in response so I untied it then removed the sash from my horse's head and tugged his reins to lead him onwards, away from the narrowed path to allow the others to follow. It seemed to take an eternity for all the other riders to get across but we were on our way again, moving carefully up the winding path to the top of the gorge. It had taken several hours to reach the top and it wouldn't be long before daybreak. I had no idea how far Astrid and the main force had gone into the valley, far below but, at long last, we were in a position to protect them. As the sky began to turn blue for the second daybreak of our journey I brought the company to a halt and rode slowly to the edge of the gorge, Halberad at my side, and scanned the valley floor. In the half-light, we could see nothing, but then, I pointed. With Astrid at their head, I saw the main force moving slowly along the canyon. I pulled my horse's reins to the right and spurred him away, waving the company to follow. We rode hard as the sun climbed into the sky and eventually the ground began to fall to meet the valley below. I quickly reined-in Fleet-Foot. Ahead, camped in the foothills around the exit, was a troop of enemy soldiers. Some mounted but mostly footsoldiers wielding axes and halberds, but along the cliff sides were ranged bowmen, waiting to pick off the first of Astrid's force as they appeared from the gorge and Astrid was right at the head! I had just one hundred men and we were facing at least five hundred but we had one advantage, they didn't know we were here! The main thing was to stop the bowmen, but how. We could see the ones on the opposite side but those below us? Time was short, I had to think fast. Halberad rode up beside me and we briefly discussed the situation. He nodded and turned away to brief the others. I turned back to the gorge and thought of my beloved Astrid and what would happen if I got this wrong. I was jolted back to reality by one of the scouts appearing beside me. “They are coming, My Lady,” he said. When I turned, Halberad had ranged the archers just out of sight of the other side, bows at the ready. The rest of the company was ready to gallop down the hill, swords drawn. It was time. The moment Astrid appeared, I spurred Fleet-Foot on, followed by ninety horsemen. At the same moment as the enemy archers stood to draw their bows they were brought down by the hissing arrows from above. The ones on the nearest side were so surprised by this sudden turn of events that they looked up the rock face and gave away their positions and were brought down by the swift actions of Astrid's own archers. I spurred my riders on straight into the enemy encampment and Astrid led the main force at full gallop out of the gorge. Hacking and slashing, swords flashing in the cold light, the ring of steel on armour, screams and shouts, no time to stop and think, just fight for our lives! Fleet-Foot held firm as we rode through the melee and my sword claimed many lives, dripping with the blood of Samerron's men. Suddenly, I saw her, Astrid, on the ground, her horse lay dying beside her. Her sword in one hand and dagger in the other she was swinging for her life, surrounded by the bodies of those she had killed. I galloped to her and grabbed her arm as I passed. She ran and threw her leg over behind me and we rode on, out of the main battle. They never knew what had happened and, after what seemed like an eternity, the remains of the enemy force threw down their arms and surrendered. It had been a bloody fight and I was exhausted. We had not escaped unscathed and around one hundred of the original thousand lay dead or dying on the ground amongst the horses and enemy. Astrid slowly slid to the ground and I followed her. She stood quietly for a moment and swayed slightly. “Astrid?” I took her arm and she winced. I quickly let go. There was blood on my hand, her blood! I saw blood was dripping off her fingertips! She had a nasty gash in her upper arm just below her shoulder. I unfastened the thick leather jerkin and slid it carefully from her shoulder. There was a nasty gash in the flesh but the strong sleeve had taken most of the force of the blow and, though bleeding and open, the wound was not deep. I took a strip of fabric and wound it firmly around her damaged limb, stemming the flow of blood and helping to ease the pain, then helping her to get her arm back into the sleeve of her jacket. My heart swelled as I looked at her. “As I will you,” was her reply, gazing back at me. Under our guidance, the remaining riders laid our dead together and covered them in a shallow grave. They marked it with runes so we could return and give them the funeral they deserved if and when the enemy was defeated. The surviving enemy soldiers were left to deal with their own before being tied together by the ankles to prevent them from turning against us. Astrid and I sat together to eat a meagre meal of oat bread and water. We were about to settle down for a little sleep when Halberad appeared before us. “What is it, Halberad?” Astrid asked him. “Can we trust them?” I turned to Astrid. Halberad turned and left and we sat for a while in silence. “What are you thinking, Anna?” she asked me after a time. Astrid took my hand in hers. I tried to sound confident but inside I was anything but. He should have met us yesterday at our first stop but now, on the third day of travel, he had still not appeared. The Draaken was an important part of our plan but without it? I didn't like to contemplate how we would defeat Samerron's forces. We rested, then, until the daylight began to fade into darkness and it was time to set out into the third night of our journey. We were about half way to Pelengrath and the enemy now knew we were coming. Our force was weakened by battle but our resolve was stronger than ever. The force that was squeezing the life out of my city was not a slave army but Samerron's own elite followers. They would not surrender so easily. Astrid, beside me on another horse, turned to face me. “Ready?” she asked. I nodded and smiled. She raised her hand and lowered it again, the signal for the company to move off. Nine hundred men, plus around a hundred and fifty others who had sworn their allegiance to us, moved away in silence.